SUpaZone is a script that runs the Nightmare Zone minigame. One of the best combat training methods in game. Different inventory settings, e.g. Absorptions, Prayer Potions, Super Restores, Overloads, Rock Cake, etc. Perfect for Dharok melee training, ranged and magic training. Make sure the coffer is filled with coins. 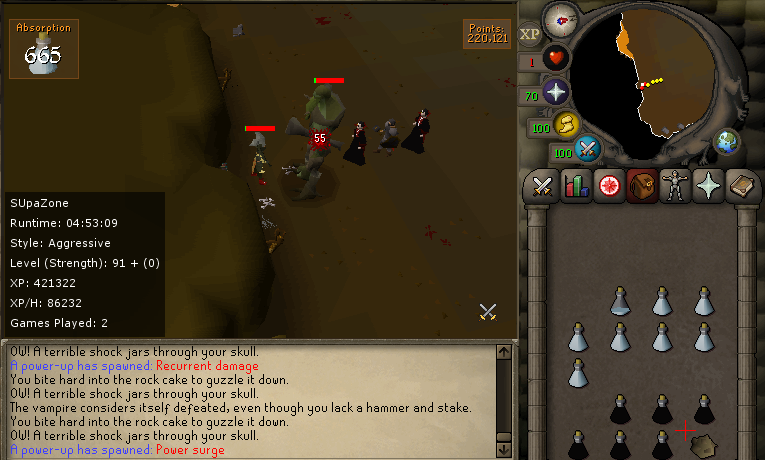 Select the monsters to fight in the NMZ by drinking the potion in the NMZ-area. Make sure you have the required (selected in the gui) resources in the bank, dispenser or inventory, or you have enough points for restocking at the chest. Configure to run in fixed mode. Place your character anywhere near the NMZ area or the bank in Yanille (NB: The script cannot be started within the minigame). In the configuration window you select how many items to bring for each trip. If overloads are selected, then the player needs at least level 51 hitpoints. If prayer potions or super restores are selected, then the player needs at least level 43 prayer. It will only use the Protection From Melee prayer. The script will not start if these requirements are not met. The script relies on auto-retaliate to engage the monsters (Auto-retaliate will be activated by the program). Q: Why does the script start and cancel the dream over and over (or show other odd behaviours)? A: Clear the jagex cache and restart the client twice. Q: Why can't I change the monster? A: Start the script from the monster selection panel with the desired monsters selected and all resources in the inventory. Q: Why does the script stop after 4 hours? A: Log out and back in to the client. Q: Will you add prayer flicking? Q: Can I buy the script for rs gp? Wow, what timing. Literally as I'm attempting to use your outdated client, you integrate your new client with old... thanks a ton. What % will you drink absorbs at? I literally was just starting to make an NMZ script about 2 hours ago because yours didn't support this. Haven't tried it yet but nice release. There are some issues with absorptions. Looking into it. Hmm, I cannot seem to reproduce the error. It's drinking absorptions when it falls below 200 points here (which it should). Works great! I did have one problem after the script had run for 1.5 hours, where it stopped using the dwarven rock cake. I had to manually get myself down to 1 hp, but it kept using the ovls and absorptions just fine. Not a huge problem, just curious as to why it stopped using the rockcake. Thanks for a good script! Edit: I'm going to run it again to see if I have the same problem. I'll let you know. Update: After going through 3 doses of overload, and my 50 hp was restored, it used the rockcake instead of another dose of overload. Having a bit of trouble getting the bot to work here. I followed the setup instructions, the bot gets inventory from bank, buys the potion,talks to the npc again and gets the potion cancelled then stops doing anything. Does it attempt to drink the potion at all? It should only talk to the npc if the potion is empty. Nah just talks to the npc again right away. Hey SUpa, love the scripts my man as I already got 99 with your SUpafletch one! Been training range w this NMZ bot and loving it so far as well, my only request is that you code in the power-ups in NMZ too. Other than that keep up the great work! as soon as i start script. selected everything in gui. runs to bank . then script stops. i got it to work other night, i know what i did wrong. i was suppose to get the pots first , but since rs was updated it wont work period for me. Was having trouble with script when after starting it checks you attack style and then does nothing else, but after restarting client it works fine. Also sometimes it seems to stop unexpectedly while banking in between runs. As in you get to the bank for the second run but doesn't open the bank and stops. Any idea's why i'm only getting 28k a hour xp? Works great, but for long term use this is almost a guaranteed ban, due to how the mouse teleports instead of moving naturally.